Fab Friday with Tiddly Inks! It’s Friday!! I have been having one of those weeks that seems to drag on and on and on, so I have to admit that I am happy to see the weekend on the horizon! Oh, and it’s the first weekend of the Christmas craft fair season here in Calgary, so I am EXCITED!!! Time to go and be inspired! Speaking of inspiration, I have a bit of birthday inspiration for you today for Tiddly Inks. 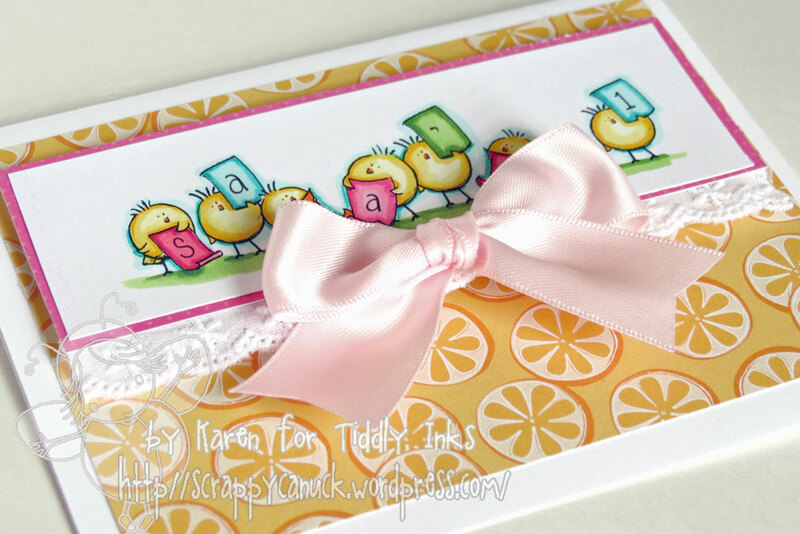 This was a really clean and simple card that I created for my little niece who turned one recently. I used the digi called For the Birds because I loved the fact that I could add more little birds onto the end of the image so I would have just the right number of spaces to include her full name! This digi comes with some birds that are joined together, but also little single images as well, so you can customize the grouping of birds to suit your message (this reminds me of those personalized Christmas ornaments…in fact, I think I need to make a version for Christmas). I simply coloured them up with Copics after I printed them, hand lettered the name, and added some Ribbon Resource ribbon. Easy peesie! Well, besides my first craft fair this weekend, I plan to get a some crafting a new tutorial video done this weekend. 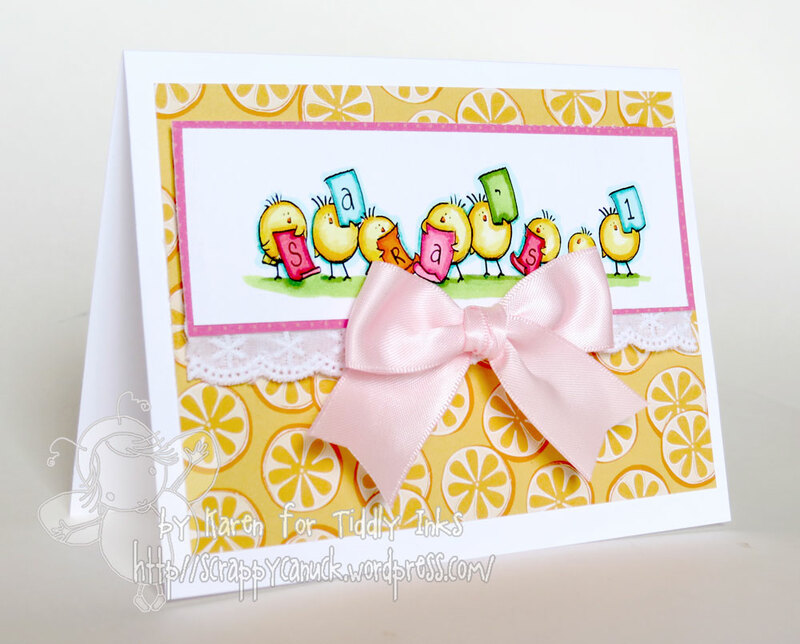 If you are in need of some inspiration as well, make sure you pop on over to the Tiddly Inks challenge blog – Fab Fridays are always so fun because the variety of creations is huge! There is something for everyone! This entry was posted in Cards, May Arts Ribbon, Tiddly Inks and tagged birthday, card, for the birds, May Arts, tiddly inks by Scrappy Canuck. Bookmark the permalink. Karen, this is such a wonderful card! Those little birdies are fabulous! If I recall, I think there is a Christmas version of these birds that came out last year. I love it! !